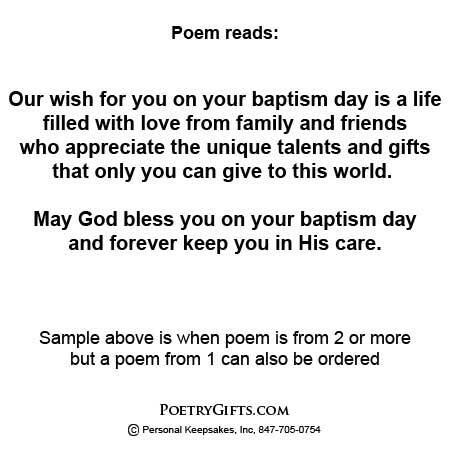 If you are looking for a meaningful, personalized baptism gift for a baby boy, consider this lovely Baptism Poetry Gift. The gold cross design is personalized with the child's name, Baptism date, church name, and a closing message from you. 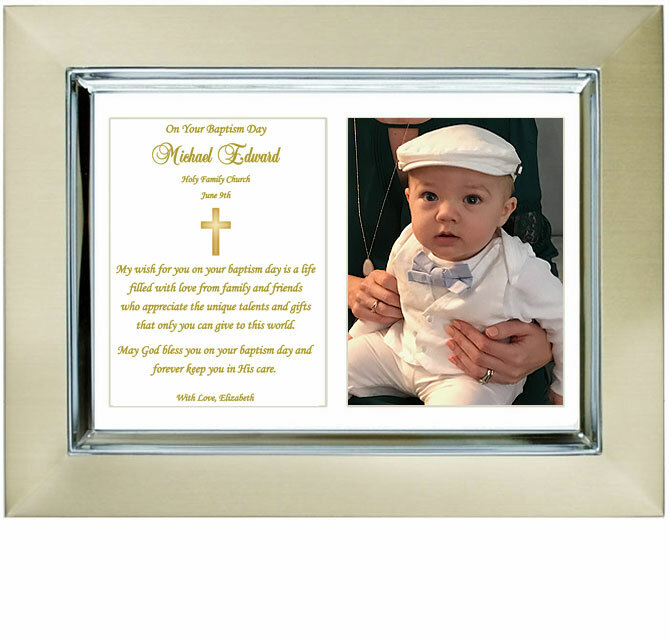 When a picture of the baby boy on his Baptism day is added to the striking brushed gold and silver metallic 5x7 inch frame, it becomes a custom Baptism gift you can be proud to give. Baptism days are very special. It's a day that family and friends come together to celebrate this religious milestone in the life of a child. If you need a gift for the party, check out our EXCLUSIVE Baptism photo frame. 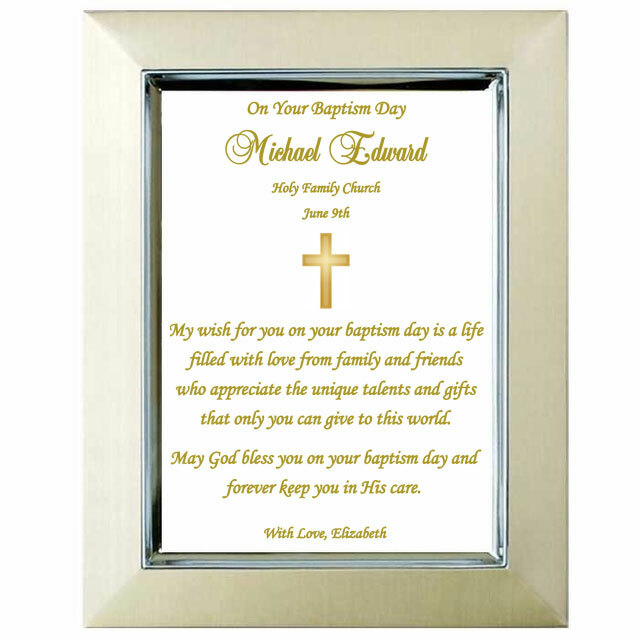 The personalized poem and striking gold cross design is presented in a rich-looking silver and gold brushed metallic 5x7 inch picture frame suitable for displaying on a shelf or table or it can be hung on a wall. Outside frame dimensions measure 7" x 9". The cut-out photo area measures 3" x 4". A truly unique Baptism keepsake for your son, grandson, nephew, cousin or Godson! 5. Closing Phrase and Your Name(s) (as seen after poem) - (Examples: Love Always, Mom & Dad; With Love, Aunt Tammy & Uncle Will; etc.)" The photo opening is approximately 3" x 4". You can display the most important part of a larger photo. If you do not want a photo area in your Poetry Gift, choose the No Photo Area option when placing your order. I have ordered these beautiful frames on 2 different occasions as gifts and the recipients are pleased to have them as a momento their child's baptisms. Would recommend and would purchase again from this company.